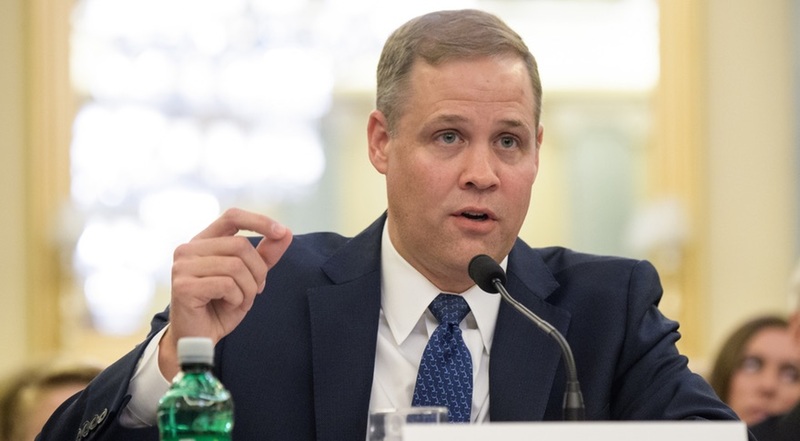 WASHINGTON — Several members of the House Science Committee used a hearing on NASA’s latest budget proposal March 7 to criticize the Senate for not acting on the nomination of one of their colleagues to lead the agency. The full Senate has yet to take up the nomination. Congressional sources say that Bridenstine’s nomination lacks the needed 50 votes for passage. All 49 Senate Democrats are opposed to the nomination, as is reportedly Sen. Marco Rubio (R-Fla.), who stated concerns about the nomination when it was announced in September but has not recently commented on it. With Sen. John McCain (R-Ariz.), who has also been said to be skeptical of the nomination, still absent from the Senate because of cancer treatment, there are only 49 yes votes. Despite the partisan divide, one committee member said that failure of the Senate to take up the nomination was not one of Republicans versus Democrats. “This is not, however, a product of partisanship,” said Rep. Dana Rohrabacher (R-Calif.) during the hearing. Even a Democratic member of the committee expressed support for Bridenstine’s nomination. “Is it time to have somebody permanent in that position? Is it hard as an acting administrator to move the agency forward?” asked Rep. Ed Perlmutter (D-Colo.). Perlmutter is one of the few Democratic members of Congress to publicly support Bridenstine’s nomination. Lightfoot said that he hasn’t experienced problems working with the administration despite leading the agency on an interim basis. “For the past year I’ve had no trouble having access to the people I need to have access to,” he said.